The Australian War Memorial has Archival footage of the Engineers camp at Moore Park, Sydney. Possibly filmed anywhere from late 1915 to early 1916 as the still photographs from this footage were published in the “Sydney Mail’, on March 1st, 1916. The film is in extraordinary condition and captures what it must have been like for the men of the 1st FCE as this was their home up to their embarkation a few months earlier on October 18. It gives a panoramic view of the Engineers camp and footage of the Engineers marching out of camp with horse drawn wagons containing pontoon bridge equipment on their way to Centennial Park. It shows the Engineers constructing the pontoon bridges and rowing them into positions and then tested. A wooden footbridge is also constructed and showing its complexity. At the end Signal training using flags, heliograph, telegraph and radio is demonstrated. General Bridges in March 1915 introduced the cloth badge or colour patch as part of the soldiers accoutrement to be worn at the head of each sleeve of the uniform. The shape would be the same for all units of the 1st Australian Division – 2 1/2 inches wide and 1 3/4 inches high. The Engineers colour was purple and henceforth they became known as the purple patches. 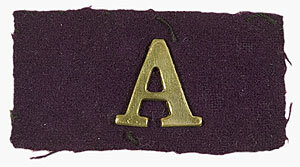 The brass “A”on Purple Patch- indicates the soldier was at the Gallipoli Campaign. Australian troops of the 11th Battalion and 1st Field Company of Engineers assembled on the quarter deck of HMS London, part of the fleet which carried the Australians from Lemnos for the Gallipoli landing at Anzac. Note the improvised anti-aircraft gun mounted on the capstan. 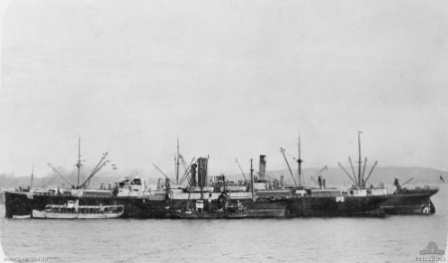 Troops of the 11th Battalion and 1st Field Company Australian Engineers assembled on the forecastle of HMS London, part of the fleet which carried the Australians from Lemnos for the Gallipoli landing at Anzac Cove. HMS Bacchante is steaming ahead. 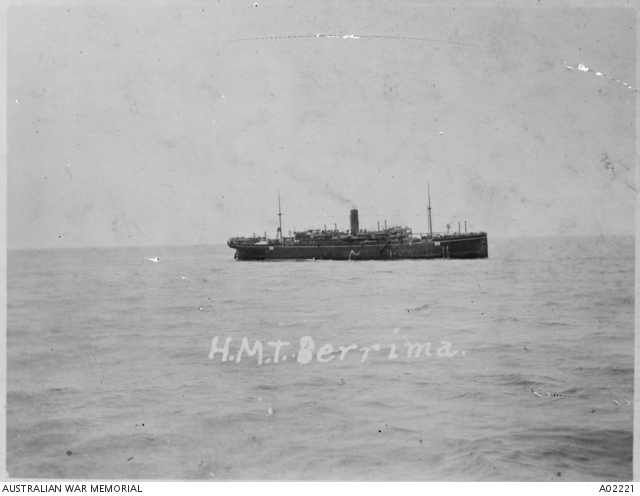 Photo taken by Ellis Ashmead -Bartlett at sea 24th April 1915.